Brew In A Bag has certain advantages over a three vessel based system, most notably in terms of convenience. While a three vessel system can be made small, collapsible and quite simple to pack away, everything you would ever need to Brew In A Bag will fit inside your pot. While a permanently installed three vessel system in your garage or shed may be quite quick to get a brew on, having a collapsible three vessel system will take a while to set up and check over and Brewing In A Bag will still get you a brew on quicker than either! The equipment requirement for Brewing In A Bag is significantly shorter and less costly than a three vessel based brewery, you've got two less vessels for a start! Your single vessel can be as simple as just a big pot. I did my first Brew In A Bag with just that – a big pot on the hob, no tap or hop stopper or any other bells or whistles – and it produced a perfect pint. That said, it still produces great beer and it's easier to get the wort out now that it does have a tap and hop stopper! For single brew lengths (5 gallons) consider a 50l pot. A pretty standard 5% brew will need around 37l of water + the space that the grain takes up and you really don’t want to be getting right up to the top! Before you buy however, consider where your brewing is going: Is BIAB a stopgap to get you brewing all grain beer but you intend to build a full three vessel system? Maybe you want to brew more than 5 gallons at a time (either BIAB or future three vessel)? This was my situation, so I bought a 70l pot allowing me to boil for a 10 gallon brew. As it happens this will allow for a double length 4 or 5% beer Brewed In A Bag, albeit using an offshoot process from BIAB called maxi-BIAB, more on that later. For gas users, you can BIAB on your gas hob with great results but this ties you to brewing in your kitchen and tying up the hob for most of the day, SWMBO may not be too impressed if trying to make Sunday lunch while you brew and you will need a decent cooker hood extractor to cope with the steam from the boil. The alternative is a dedicated burner and bottle. Anything over around 7.5kW should get you a decent boil and you can take your brewing to your shed, garage or garden. If you are going to boil outside you should consider some form of wind break to make sure you get the maximum heat into the bottom of your pot. If you have a big pot, then you could consider a paella pan burner to give more heating area or the more standard square ones. For electricity users the consideration really is only the number and type of elements to fit to your pot. Much discussion exists on this topic in various brewery build threads, the general consensus though is that two kettle (or other “proper”) elements should be plenty for even a double length brew. One hole in your pot that you really do need is a drain. Siphoning your wort out from your pot is possible but is time consuming and tends to result in a lot of “break material” making its way to the FV. Also it would be next to impossible to use a siphon system with a counterflow wort chiller if that is your preference. Draining is either through the side of the pot or the bottom. There are numerous boiler build project threads which discuss the relative merits of bottom Vs side draining and false bottoms Vs hop strainers and myriad designs for all. Except for the restrictions imposed by using gas as a heat source, every option comes down to personal preference and circumstance. My own set up is currently a side drain with a single tube scavenger/hop stopper. Another addition you might consider is a sight glass, a clear polycarbonate tube emanating from near the bottom of your boiler and running up the side giving an indication of the fill level. The only really BIAB-only piece of kit you’ll have to invest in is a grain bag. There are commercial models available but they won’t fit a big pot, you’ll have to befriend a seamstress to get one made. Pure cotton muslin voile is ideal as is the nylon voile used for curtains. Just remember that there is going to be 10kg of wet grain in there at the end of the mash. Seams need to be triple stitched and taped and a drawstring on the top is a must. Tapes running under the bag and crossing in the middle of the bottom panel mean that the pressure on the bottom seams and material is reduced. Simply cut a circle 5cm larger diameter than the external diameter of your pot, then a rectangle with one edge about 10cm longer than your pot is high and the other edge about 5cm longer than the circumference of the circle you just cut: so that's length = (3.14 x (pot diameter + 5) ) + 5. The chances are that you already have a plastic paddle if you came from kit brewing and this is ideal for BIAB, if not, they are inexpensive and readily available. A decent thermometer is a must. A digital meat thermometer is ideal and one of the “stick it in and leave it in the oven” ones is best, you can dangle the probe in your mash and leave it there. Better still, they usually have high and low alarms on them so you can set a “my mash is too cool” alarm. Essential in all grain brewing to make sure your mash has been efficient enough and to help hit the gravities specified in your recipes. Ideal for extracting wort from between the pot and bag for testing! A ladle would also work pretty well but is more awkward. You’ll need a bucket (your intended FV will be fine) and another vessel of some kind – I use a jam pan. You need to time your mash, boil and additions. Most brewing software has built in timers – I now use Beersmith Lite on the iPad for my brewday timing. Some method of cooling your wort is required. This can be as simple as just leaving your FV to cool in a cold place (outside or a bath of cold water), a dedicated canister for cooling, an immersion or a counterflow chiller. Most brewing software can handle BIAB equipment and mash profiles. Personally I chose Beersmith and, with some tweaking here and there, I've got profiles that are starting to work well with my equipment. A big balloon whisk, electric hand whisk or my personal favourite, the paint mixing paddle and cordless drill! With your equipment all gathered, a shot of courage and a healthy dose of optimism it’s time to crack on and Brew In Your Bag. Here’s a simple recipe to get you started, based in fair part on Graham Wheeler’s Hooky Bitter Recipe (and I thoroughly recommend his book “Brew Your Own British Real Ale”, the recipes are easily workable into a BIAB friendly form) and which was also my first and turned out really well. You can make life easy on yourself by just ordering the whole recipe from those suppliers happy to do so. Both The Malt Miller (recipe not yet online but if you email Rob he'll do it) and The Homebrew Company have agreed to supply the recipe in kit form. Note that the The Homebrew Company will provide a standard crush and so the first step of the mash time should be increased by an additional 30 mins to ensure maximum efficiency. They will also supply a whirlfloc tablet instead of Irish Moss. There is no rehydration required with these, just throw it in where the walkthrough tells you to add the rehydrated Irish Moss. So, fill your pot with 35.5l litres of water and add a crushed Campden Tablet to neutralise any chlorine and chloramine in your tap water. Other water treatments for now are just an additional complication that you really don’t need – wait until you have 20 more BIABs under your belt before you even think about it. Set your thermometer’s upper alarm to 70 degrees Centigrade and dangle the probe in. Turn on as much heat as you can and start to organise everything else you’ll need – do it in order, have your grain ready, your paddle etc. Stir your pot now and then just to be sure the liquor is the same temperature throughout, do it more regularly as you approach your strike temperature of 70 degrees. Also as you get close to strike temperature, get your bag in the water, pull the opening of the bag over the lip of your pot and pull the drawstring to keep it in place. You’ll have to move your thermometer probe to inside the bag too. As soon as you have 70 degrees C, turn off the heat and start to dough in. A big jug in one hand and your mash paddle in the other and stir as you pour in your grain rather than dumping it in and trying to stir out the lumps. You can’t over-stir a BIAB, so really go for it, we don’t care if our grain gets waterlogged! When you are done, put on your lid and check time and temperature, note them both. Change your thermometer alarm settings, max should be 68 degrees C and min 65 degrees C. The actual temperature you are looking for is 66.7C but just keeping it in that range should be fine. The grain should have taken the temperature down to about 67C. You now have a choice. You can either insulate your pot so that it doesn’t lose heat over the next 90 minutes or you can just warm it up whenever the alarm goes off. As I use gas and a cotton bag this is just as simple as turning on the burners and stirring until I get back up to 67 or 68 degrees. I’d probably worry about nylon bags and electric elements though so if that’s your setup maybe go with the duvets/hot water cylinder jackets to keep the heat in. Give your grain a good stir now and again – remember the low concentration of those enzymes, mix them up a bit to get the best coverage and the most out of your grain. When 90 minutes is up, fire up your heat – again, be careful with electric elements (maybe you could pull more of the bag down the outside of the pot to make sure it is away from them) – until you reach 76 degrees. Maintain this temperature for 10 minutes. This is the BIAB equivalent of a Mashout which is designed to let the amylase which makes long chain unfermentable sugar from starch continue to work but prevent the other amylase which breaks it down to fermentable maltose from doing its job thereby giving body and mouthfeel to your beer. Put your colander in the bottom of your “other” vessel, not your FV – put it close to your pot where you can lift the bag to easily. Put your FV beside it. When time is up, take the thermometer out then loosen the drawstring and unhook the front of your bag from the pot. Then quickly, without unhooking the bag from the rest of the pot first, pull the drawstring closed. Now slowly start to lift the bag out of the pot. Lots of wort will be trapped so you will have to wiggle, jiggle, bounce and do whatever you can to keep the wort running. Just don’t squeeze or you run the risk of releasing too much tannin from the grain husks. When the flow slows down and you feel the burn in your arm muscles transfer the bag to the colander and take a rest. Get the heat on to full to get the boil under way. As the wort heats, periodically take the bag from the colander and tip the collected wort into the pot then return the bag to the colander. Now everything is just the same as the three vessel brewers do. Be sure to understand how your wort chiller of choice works as you will have tasks to perform towards the end of the boil to prepare it. Just before you reach the boil, somewhere around 96 degrees, add the first batch of hops and measure your pre-boil volume and gravity, note them. Hopefully you should get around 33 litres @ 1.032. Once you are boiling, sanitise your FV and all your fermentation bits and pieces, lid and airlock and bung and what have you. Prepare your chiller if you have such a thing. After 65 minutes from when your wort actually starts to boil, use your turkey baster to add half a mugful of wort to your Irish Moss to rehydrate it. After a further 15 minutes chuck the mugful of wort and Irish Moss into the pot along with the second batch of hops. If you are using an immersion chiller, you should put it in now but don’t turn the water on. If you are using a counterflow, you could sterilize the thing by running some hot wort to your FV and tipping it back into the boiler – you would ideally want to re-sanitise your FV. Boil for a further 10 minutes and take another sample, chill to around 20 degrees and measure your gravity and your volume. Hopefully you now have about 27 or 28 litres in your pot @ 1.040. If you are over gravity but under volume the chances are your efficiency is right, just add some water to bring your volume up and your gravity down. If you are over volume and under gravity then again, your efficiency is probably right but your boil off rate is wrong change it in your software next time out. This brew however you can either just ferment it and get a weaker beer or keep boiling. This will affect your 10 minute hop addition though, you would probably want to add a bit more Fuggle once you are closer to the 27l. Another alternative in this case is to use malt extract to bump up the gravity, just dissolve it in a little hot water and add it. If you are up on gravity but right on volume then you are more efficient, just ferment it for a stronger beer or you could liquor back to the right gravity and get more beer at the right strength. If you are on gravity but under volume, again just make do with less beer at the right strength. Next step is to get your wort out of the boiler and chilled. If you haven't used an immersion chiller you will have the "cold break material" in the collection vessel. You could rack from the collection vessel to your FV to remove this debris once cool, it should ensure a clearer beer. Once you are down to the required pitching temperature of your yeast, you need to aerate your wort (you want to see a really good foamy head), pitch your yeast, add your lid and airlock if you use one and tuck it up at 18 degrees to ferment. After 5 or 6 days rack to a clean FV and add the final batch of hops, then leave it alone for a further 10-14 days. Bottling or kegging is the same as you would for kits or extract brews you may have done, in this case use around 4.7g/l for a nice aley-but-lively carbonation. Leave it in the warm until the bottles clear again. It should come into drinking condition about 3 weeks after that. You need to consider several things, some of which are specific to your equipment. Notice that there is no allowance for deadspace. That will just be rolled up with the hops and trub and gunk. I want 23l in my FV. 3.88kg of grain once drained sitting on a colander will contain 2.37l of water (610g of water per kilo of dry grain). Although with a pure water run, my boiler only leaves one litre, used in anger it is much much more. 3.8l there. Then boil off. My 70l pot boils off 3.5l per hour. That's 5.25l This varies with the surface area of your pot, the intensity of your boil, the atmospheric conditions etc. I've worked all that calculation into an Excel brew sheet to make life easier if you and equations just don't get on. Get the BIAB Brewsheet. Measuring your initial volume is easy, you have a jug, just add it litre by litre and keep count. Alternatively, if you have accurate enough scales you could add as many kilos of water from a hose from your tap as you need litres. Just remember that lifting a pot with 36kg water in it isn’t for the faint hearted! If you have a sight glass things get really easy, calibrate it once and just add water until you get to where you want to be. But what about pre- and post-boil volumes if you don’t have a sight glass? It’s maths time! Measure the internal diameter of your pot. Note it down. Add, using a jug, your starting volume then measure the height from the water surface to the top of the pot. Empty volume = 21.5 x (44.5 / 2) X (44.5 / 2) x 3.14 = 33421 cubic cms. There are 1000 cubic cms to the litre so that’s 33.421 litres. “Why don’t you just do that for the whole height of the pot?” I hear you ask… Well the bottom of the pot has your metal work in it and also has rounded corners etc. whereas the top of the pot can pretty safely be assumed to have straight sides. The other method for in-brew measurement is to build yourself a calibrated dip-stick. To do this all you need is a suitable thin stick and some time before your brew to add a litre of water, dip the stick, mark it, add a litre of water, dip the stick, mark it, add a …. You get the idea. Really, write down as much as you can! It helps you understand your kit and makes planning future brews more accurate. Recalculating your initial water volume. No doubt your pre- and post-boil and in-FV volumes from your first BIAB were wrong. Hardly surprising, everyone's kit is different and will have different properties. If you have taken proper notes you will know your pre-boil volume. Subtract that from the total you started with to get your total grain absorption. Divide by the total weight of dry grain to get your new grain absorption rate. Next you know your post boil volume. Subtract that from your pre-boil volume and divide by the number of hours you boiled for. There's your new boil off rate. Next you know your volume in your FV. Subtract that from your post-boil volume to get your new hops + deadspace + trub loss volume. Subtract the hop absorption from that to give your new dead space and trub constant volume. Use these figures when you calculate your next brew and you should get a lot nearer. Bear in mind though, that big brews and mega-hopped brews will likely throw your rates and constants out a bit. Just beware and remember to take notes! Again, I've worked that into the BIAB Brewsheet too, just fill in all the values on your brewday and it'll work out all the stuff that wasn't quite right. ThAts brilliant thanks, does anyone have pictures of their biab set ups so I can get an idea of space requirements and that? Thegoldenheap wrote: does anyone have pictures of their biab set ups so I can get an idea of space requirements and that? But in essence it is just a 70l steel pot. It measures 45cm in diameter and 45cm in height. It fits rather neatly on my gas stove. And that's it! The rest is just buckets to drop the bag into and collect the runnings that didn't stay in the pot. Thegoldenheap wrote: ThAts brilliant thanks, does anyone have pictures of their biab set ups so I can get an idea of space requirements and that? Really nice guide there Calum, well done. If it's ok with the mod team I'd recommend the calculators over at BIABbrewer, the basic calc got me through about my first 10 brews really well and for the more advanced their BIABacus is a beast. Takes a lot of guess work out of the equation! I'd also like to recommend customBIAB for their bags. Mine is still going strong and was worth the wait. It's the wife of a member on JBK who makes them to order. Great quality although there is a waiting list for these. Last edited by Cpt.Frederickson on Thu Apr 17, 2014 10:34, edited 1 time in total. I will look out for a pot, what one is yours? Looks like a bergland to me. Not so easy to get your hands on in the UK any more as they have a UK distributor now. The Malt Miller sells them as do a couple of other brew shops. Last edited by HoppyG on Sun Apr 13, 2014 18:35, edited 1 time in total. 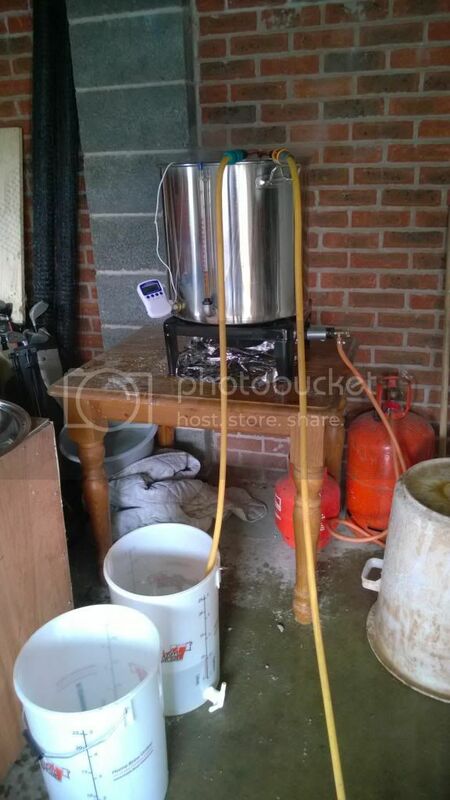 Another place worth a look is HomeBrewBuilder. Good for custom jobs and a decent fella to deal with. Currently working out details for my new setup with him, but I know lots of others on here have bought stuff from him and are extremely satisfied. Ha! I'll dig it out and add it! Brilliant guide, thanks! Will be giving BIAB a go, just sorting equipment and tidying my brewing area in the garage first. Yes great guide Calum, thankyou. Fantastic guide Calum, I'm looking into getting the bits and bobs for a BIAB system and this has been massively helpful to me. Let us know how you go!! And we want pictures! Calum, Just a quick one, when you mention about chilling the wort, you say "Next step is to get your wort out of the boiler and chilled"
You need to get it out of the boiler. You need to get it chilled. Whichever order is fine, personally I transfer hot wort and leave it to cool in the FV. I have no issue with fermenting on the cold break material. Others have immersion chillers which cool in the boiler, other still have counterflow chillers which chill between boiler and FV. There are pros and cons to each and it's a debate that will rage on for many years to come.